EDClass is a remote learning application designed to help break barriers to learning with online assistance through EDLounge qualified and assisted tutors using the personalised e-learning aspects. EDClass + was developed again with the Senior Leaders, Head Governor and CEO of the Rodillian Multi Academy Trust to educate all those students that were not attending the 6 schools within their trust within specific times and periods of the day. Your staff and our staff work with their students to give them support and assistance online whilst following a personalised learning pathway. Their target was simple: Educate all within their trust through an application regardless of barriers. EDClass+ is a combination of EDClass and EDVirtual (Your staff using our Virtual Classroom platform). Within EDClass + our qualified teachers work with your teachers, using our online platform and our virtual classrooms to educate the students at your provision. EDClass+ can give education providers the option of using EDClass+ to combat staff timetable clashes and staff absences. Your facility can benefit from our qualified online staff concentrating on educating your short term off-site students, leaving your staff free to educate your longer term students, such as pupils that suffer with mental health problems. Students will benefit from qualified and experienced teachers using our tailor made learning pathways to give your students the best learning opportunities that are available in a virtual learning environment. Our unique safeguarding tools have been developed with these students in mind to give educators the best opportunity to deliver lessons to off-site students whilst monitoring their behaviour and safety. 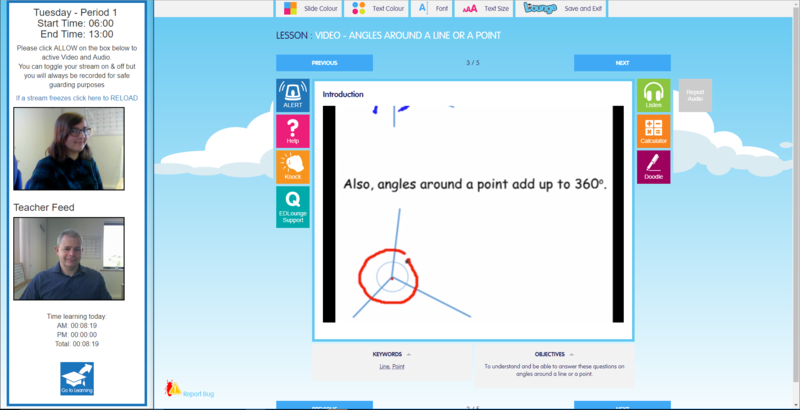 All virtual lessons can be streamed live for teacher viewing and are also recorded and automatically backed up and saved to ensure safeguarding all round. EDClass+ is a virtual, remote learning application, designed to help break barriers to learning, through personalised e-learning content via EDLounge and qualified teachers / tutors for online support. Our staff can be used to help disengaged students gain knowledge for qualifications, support teaching and learning through an online classroom and work with students individually to achieve their goals, alongside supporting your staff with the e-learning aspects and administration. Our teaching and admin staff will also personalise the students e-learning pathway (8000+ lessons, 2000+ learning pathways) ensuring each student has a tailored learning experience to meet their needs. Our unique safeguarding tools have been developed with off-site learning in mind, to ensure student safety is paramount and the best that is available in an online learning environment. EDClass+ also has the facility to track off-site students learning to ensure that staff can maintain constant contact with student that are being educated off-site. Our teaching staff are available to the student at the click of a button and will help guide students through their learning. The work students have completed will also be marked by EDLounge teachers. All video recordings are saved and sent directly to your IT technicians to store and back up for data protection, child protection and safeguarding protocols. The EDClass+ facility also ties the support teacher in EDLounge to the live virtual classroom that your staff can monitor. You can see everything with total transparency. This short-term provision via our virtual classroom approach and support mechanism for reaching a range of students within and outside school has been created so that establishments can target those hard to reach students or those students on the 6th day provision, using EDLounge English, Maths and Science staff, mentors and support staff (alongside EDLounge teaching staff) to educate learners in any situation. EDClass+ can help schools and centres to educate students instantly who have difficulty attending a mainstream provision. We provide a safe and secure learning environment for hard to reach students allowing them to achieve whilst offering educators our online platform and safeguarding tools. This will help each student reach their full potential in a controlled and safe environment. EDClass+ staff have the capability to educate students on specific timetabled pathways via live video stream that is all recorded to safeguard teachers, school staff and students. Learners follow a unique pathway for them and achieve support when they require it. Within EDClass+ there is the facility to speak, support, and teach face to face via our own internal virtual platform. The visits, questionnaires must be done by yourself for safeguarding purposes but all the, chat, recordings, backups, alerts and aspects are still paramount to the process. All virtual lessons can be streamed live for teacher / student viewing and are also recorded and automatically backed up and saved to ensure safeguarding all round. The students would be able to ask for and receive help, feedback, comments, and direction from our support members, ensuring all students can progress within EDLounge. You and your organisation can see the chat live with the student and teacher. The video can work chat wise, and can be muted. The students can follow any path, timed and date stamped for their own learning. The students click on this button to activate the chat and virtual support whilst learning. Live lessons and tutoring can also occur. Once clicked it takes them straight into learning. The learning, idle and question time is recorded. The files are encrypted and sent to the school every evening once learning and the sessions have been completed. All videos are automatically sent through via your FTP and stored via a folder for safeguarding. Every file is saved, encrypted and sent to the school. This facility will enable us to further support students and the needs of those involved with these individuals in furthering their education. The difference between this and our normal support is that there is more supervision used for the students learning off-site. This approach can dramatically improve students’ attendance and achievement but most importantly educate the students within a short term exclusion, 6th day provision or those school phobia / anxious / mental health students. EDClass+ can help schools and centres educate students who have difficulty attending a mainstream provision. We provide a safe and secure learning environment for hard to reach students allowing them to achieve whilst offering educators our online platform and safeguarding tools. This will ensure each student reaches their full potential in a controlled and safe environment. EDClass+ staff enables a partnership to be created so that we have the capability to educate students on specific timetabled pathways via live video stream that is all recorded to safeguard teachers, school staff and students to meet your school needs. Our unique safeguarding tools have been developed with these students in mind to give educators the best opportunity to deliver lessons to off-site students whilst monitoring their behaviour and safety. EDClass+ and our online support system provides a great alternative provision for a range of students which adheres to government safeguarding, well-being and supervision legislation. Within this provision you have a robust and comprehensive tool that not only organisation to offers teaching and support, but also offers tutoring, assessment, pre-assessment, verification, and expertise in any subject for any age group for those doing core, academic or vocational courses. EDClass+ can also offer teaching support for any organisation. We can offer support to any individual, whether they be on or off-site. All our support officers are uniquely trained to have extensive knowledge and understanding of the EDLounge lessons, system, qualifications, methodology, exams, coursework and practical elements. An exclusive pre-assessment, assessment and feedback service is available for the students, which will help them understand, learn and progress through EDLounge. With the government introducing or planning changes to budget, attendance policies, off-site learning, exclusion, inclusion and the alternative curriculum, accurate tracking and reporting is becoming increasingly more important for educational establishments to implement systems that can; deliver these changes, accurately monitor progress in real-time and output reports suitable for an Ofsted inspection. address how you deliver a personalised learning plan to your students that have mental health issues or those that are school phobic, refusers, non-attenders, teenage parents. We can have 1 to 1, 1 to 10 or 1 to 12, 1 to 25. We can house over 200 students now with the ratios for English, Science and Maths plus other subjects for the 6th day provision or the short-term education of your students before being allowed into mainstream education. Please call 01909 568 338 for more information or fill in your details to contact us for a free demonstartion and trial. EDClass offers academy students live tutorial support and distance learning provision through a robust, safeguarded and supervised online platform. Not only does EDClass comply with government legislation for both on- and off- site alternative provisions for academies, this unique platform also gives you the tools to improve attendance in your setting. EDClass allows you to monitor and track the progress of your excluded children safely and securely online and help positively impact their learning and attendance. Our experienced team can offer you and your establishment live online support for students who are in inclusion or have been excluded. EDClass and EDClass + can dramatically improve your attendance and behaviour figures and reduce your isolation and exclusion statistics. Our e-learning portfolio has grown so fast that there are now over 7,000 resources and lessons that can be used to educate students in alternative provisions. The creation of personalised and tailored pathways for individual students ensures that they remain in education. Following this structured pathway enables a student to learn, progress and succeed whilst simultaneously supporting you to defuse any situation or problem that occurs. EDClass was designed in 2014 with the help of Rodillian Multi Academy Trusts and is now used in over 50 schools throughout the UK. It is an online learning platform that combines a bank of over 7000 lessons with EDClass teachers supporting your students in an e-learning environment. Our unique safeguarding tools have been developed with students learning off-site in mind to ensure student safeguarding is paramount and the best that is available in an online learning environment. EDClass also has the facility to track off-site students meaning your facility can maintain constant contact with your off-site students. Our tutors are available to help your student at the click of a button. Our tutors will help guide your pupils through their pathways that have been individually allocated for them taking into account their current learning ability. The work your students have completed will also be marked by EDLounge teachers. Our online tutors and supervisors are uniquely trained to have a wealth of knowledge and understanding of the EDLounge lessons, system, qualifications, methodology, exams, coursework and practical elements. By putting into place an exclusive pre-assessment, assessment and feedback service, students are able to progress and understand what is being taught and what they are being asked to do. Once a partner, we also match your assessment policies to our system so everyone adheres to the same policies, procedures, rewards and sanctions. To help students gain qualifications, a range of practice, live and mock exams have been added to EDLounge so that students are able to prepare themselves for the new next generation BTEC courses. Students also receive live and online support from our teachers in any of the qualification subjects. Our tutors provide support for students in exclusion, home education, isolation or in inclusion whilst they are on-site or off-site. Students can ask for and receive help, feedback, comments and direction from our support officers, meaning that all students can progress through EDLounge. ​This system is also ideal for students who have low literacy/numeracy ability, school refusers and Pupil Premium individuals.